Above: North side of Rankin House today, restored to its original character and structure. Imagine you're an escaping slave coming up through Kentucky. Bounty hunters know all the hiding spots are looking for that reward for returning you. You reach the mighty Ohio River and now what? High up on the hill on the Ohio side, you see a light high up on the other side shining out like a beacon against the night sky. In the winter you'd be able to cross the river by carefully treading across the ice; other times you'd look and find a small row-boat hidden in the bushes you could use to make your escape from the Kentucky slave-state, to free Ohio. Gaining freedom was still a big risk, even on the Ohio side of the river. Federal lawn made it illegal for anyone to harbor escaping slaves, even in free states. Escaping slaves could be captured by whatever means necessary, sometimes dead or alive, and returned to their former owners for a reward to those willing. Ripley was one of those cross-over points along the Ohio border where escaping slaves could hope to find refuse. The bounty hunters knew this as well and they were constantly prowling. John Rankin was just one of many who were willing to disk everything to help them move north along what became known as the Underground Railroad. 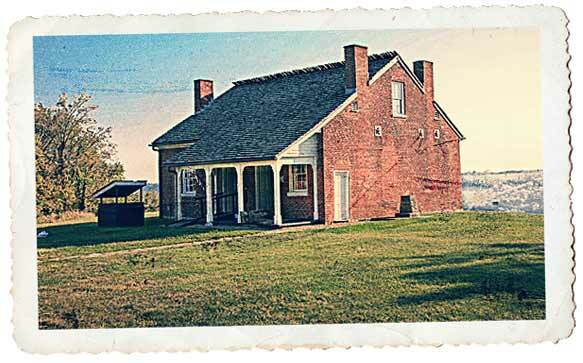 Rankin's house became a beacon that attracted escaping slaves that crossed the Ohio River. At night a lantern would be raised to the top of a 30' tall flag pole in his front yard that was a signal to the runaway slaves that it was safe to cross and that there would be people waiting to help them. 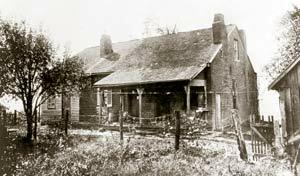 From 1825 to 1865 Rankin and his wife Jean, along with their Brown County neighbors, aided more than 2,000 slaves escaping to freedom, and sometimes having as many as 12 escapees being hidden in the Rankin home at one time. Since 1850, when the federal government revised the Fugitive Slave Act, not only could runaways be captured and returned even in a free-state such as Ohio, but those helping the slaves could also be arrested, fined and jailed for their actions. While most activists helping slaves kept their activities secret, John Rankin was an exception. He openly and boldly displayed his efforts to help the runaways. That is not to say that he took risks with their safety, only that he was open in his support of runaways. Above: The Rankin House as it appeared in the early 1900s. John Rankin took great precautions in keeping runaways safe, even when the blood-hounds were in his fields trying to track down the runaways. The Rankin property at the top of the hill included 20 acres of open land and clearly visible from Kentucky. Its position was almost a declaration that John Rankin would not be cowered by federal laws, or the bounty hunters looking for runaways. Rankin was in a way, openly daring the slave owners to stop him. In 1863 when the Confederate Brigadier-General John Morgan was leading a band of raiders across southern Ohio, one of his goals was to attack "the hell-hole of Ripley" and specifically, John Rankin. Morgan's raiders made it to within 1 mile of Ripley before being forced to move on and abandon any hope of bringing destruction upon this thorn in the side of slavery. 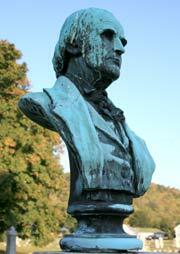 John Rankin attended Washington College at Jonesborough, Tennessee, where he married Jean Lowry before graduating. In 1814, he became a Presbyterian minister. He thus began a life-long journey of not only preaching against slavery, but putting those sermons into actions. In the next several years, John Rankin and his wife would start a migration northward toward Ripley, because he had heard that some Virginians that were opposed to slavery had settled. His migration would take several years and would take him from Tennessee up through Kentucky. As he moved from town to town, he continued espousing anti-slavery sentiments, and sermons were given in slave states. In time, he began to feel the pressure and threats from pro-slavery supporters, forcing him to continue his journey northward. By the time he reached Ripley on New Year's Eve in 1821, John and his wife had 3 sons and 1 daughter, and $50 in his pocket. While in Zanesville, Ohio, for the formation of the Ohio Anti-Slavery Society, Rankin had his first real experience with mob opposition to his efforts as he was showered with rotten eggs in town. When he stopped in Chillicothe to speak at a church on the way home, stones were thrown through the window. Above: John Rankin's first house in Ripley, built in 1822. 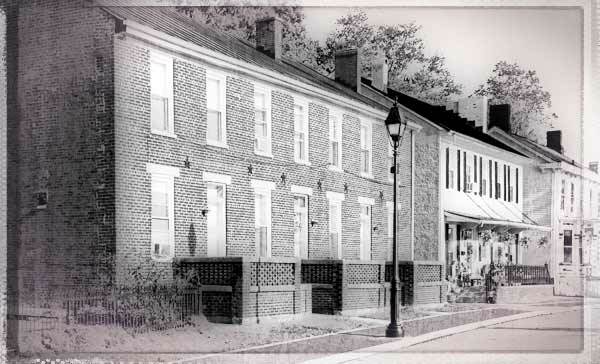 In 1822, he built his first house along the Ohio River and became a landlord in the process. The rather large house was actually 3 apartments with the Rankin family living in one and he rented out the other two. He used this house to help runaways for the next 6 years. He then decided to build a new house at the top of Liberty Hill that was further away from the Ohio River, gave him a better view of the country side, including Kentucky, and also provided a focal point for the escaping slaves. Rankin quickly became known as active "conductor" on the Underground Railroad. Prominent pre-Civil War abolitionists William Lloyd Garrison, Henry Ward Beecher and Harriet Beecher Stowe were influenced by Rankin's writings and work in the anti-slavery movement. Six years after John Rankin's death in 1886, a monument to John Rankin and his wife, Jean Lowrey, "Freedom's Heroes," was dedicated on the grounds of the Maplewood Cemetery in Ripley, Ohio.